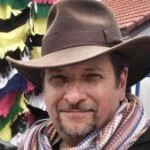 The new workflow is fully integrated with Adobe Premiere Pro CC. Creators are now free to shoot both 360 and 180 videos at the same time, from a single vantage point. Los Angeles, Oct. 15, 2018 – Insta360 announced today at the Adobe MAX conference that it will add support for 180-degree 3D capture and editing with its leading professional VR cameras, the Insta360 Pro and Pro 2. The cameras are the first-ever pro-level VR cameras to offer support for both 180 and 360 capture. The upgrade will come via a free software update, available both for the Insta360 Stitcher software and for Insta360’s integrated editing extension for Adobe® Premiere® Pro CC, part of Adobe Creative Cloud®. 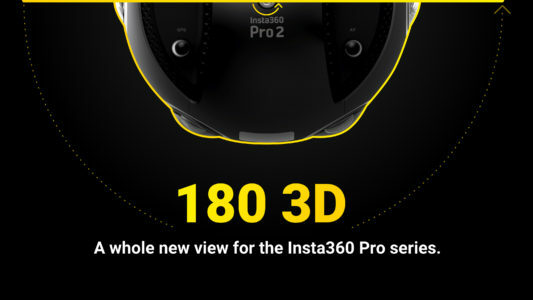 Using the new 180 3D feature, Insta360 Pro and Pro 2 users will have the option to isolate the footage captured by only the lenses necessary to capture a 180 3D video. This footage can be used to easily create a high-quality stereoscopic 180 video for playback in a VR headset, at a resolution of 4K x 4K per eye. The 180 3D production workflow couldn’t be simpler. Creators just point their camera in the direction that they want to capture a 180 3D video (the front is the direction the camera’s display screen is facing) and then start a recording as they normally would. At this time, they’ll still be recording a full 360-degree video, giving them the freedom to choose either format – or both – after the fact. Using either the Insta360 Stitcher software or Insta360’s dedicated extension for Adobe Premiere Pro CC, creators can toggle on or off a 180 3D setting when they import their footage for editing. When toggled on, the software will grab only the video files needed for a 180 3D video. In the case of the Insta360 Stitcher workflow, users will then be able to automatically stitch and convert their selected footage to a standard format for 180 VR, before carrying out further editing in a software of their choice. The Adobe Premiere Pro CC workflow is even more intuitive. The new 180 3D functionality has been added directly to Insta360’s existing “No-Stitch Editing” extension, and the workflow is as easy for 180 videos as it is for 360. After importing their footage, users will be able to immediately carry out a full edit on a proxy version of their video, allowing them to see exactly how the finished 180 videos will look without wasting a moment on stitching or conversion at the outset of their project. When the video is trimmed, polished and ready to export, the extension will stitch only the footage that made it into the final cut of the video and converts it into a standard 180 3D format. The upshot: At the beginning of a project, creators can jump right into their edit, and by the end, they’ll save time and hassle. 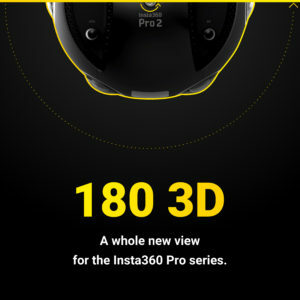 The 180 3D updates for the Insta360 Pro and Pro 2 is set to launch later this month. Adobe MAX brings together the world’s best creative minds, industry luminaries and celebrities. MAX 2018 keynote speakers and presenters include Academy Award-winning filmmaker Ron Howard, comic book artist Nicola Scott, one of the world’s most prolific photographers Albert Watson and comedian Tiffany Haddish, who will host MAX Sneaks – a preview of technology innovation brewing in Adobe Research. A live stream of the Adobe MAX keynote presentations can be viewed here on Monday, October 15 starting at 9 a.m. PT and on Tuesday, October 16 starting at 10 a.m. PT. Insta360 makes innovative cameras that capture life from every angle at once. Lightweight and versatile, they’re great for adventure sports, travel, journalism, live events, and for sharing experiences everywhere.